SAS (Statistical analysis system) is one of the most popular tool for data analysis and statistical modeling. It is one of the world's fastest and powerful software for data management, data mining, report writing, statistical analysis, business modeling, applications development and data warehousing. Knowing SAS is an asset in many job markets as it holds largest market share in terms of jobs in advanced analytics. These are the most frequently asked questions about SAS. I have collected some data to answer the questions. I will target location and industries demographics to get better insight about this topic. The data used here were collected from various job consultants, job portals, jobs and career community and research database. The median entry-level salary for analytics professionals is Rs 4.5 lakhs; Rs 5.8 lakhs salary for mid-level professionals with 2-5 years of experience in analytics industry; Rs 8.8 lakhs salary for those with 5-10 years of experience and Rs 15 lakhs salary for professionals with more than 10 years of experience. 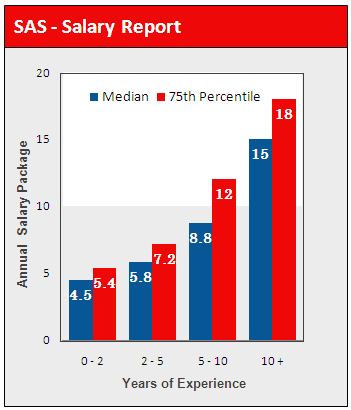 The chart below shows median and top quartile salary for analytics professional with their years of experience within the analytic industry in India. All the salary figures mentioned are in Indian Rupees (lakhs). I searched for jobs related to SAS that were posted on Naukri.com (India's No. 1 Job Search Site). 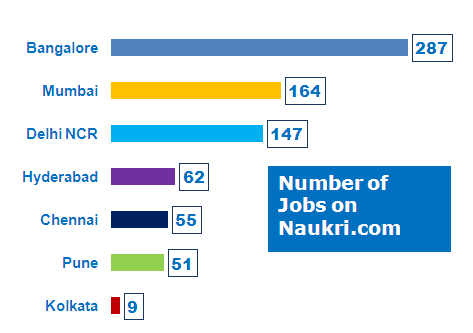 In terms of number of job opportunities by location, Bangalore topped the list with 287 jobs while Mumbai being second in the list with 164 jobs. 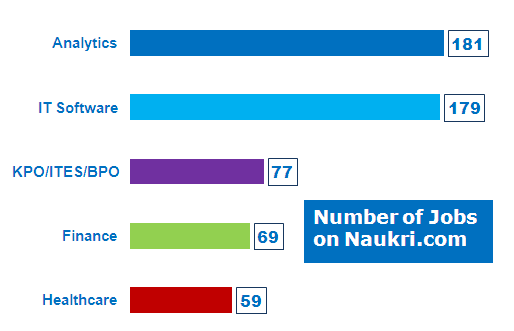 In terms of number of job opportunities by functional area, Analytics topped the list with 181 jobs while IT Software being second in the list with 179 jobs. SAS has over 40,000 customers worldwide and holds largest market share in advanced analytics. It has been tagged 'leader' consistently in advanced analytics platform as per Gartner 2015 and 2016 reports. In finance (BFSI) industry, SAS secured No. 1 spot and used as a primary tool for data analysis. Many financial companies are still reluctant to use R/Python programming language as they have been using SAS for 30 years, and they have automated the whole process of analysis and have written millions of lines of working code. To convert all the stable reporting system from SAS to R/Python, it may cost 50-100 times more. If you think R/Python will overtake SAS in future as SAS is an expensive tool. You might be wrong. The SAS licensing fees is nothing to a bank or a drug company as they can afford it. 117 Responses to "Analytics Companies Using SAS in India"
Thank you so much for your lovely words :) It would motivate me to work harder. I can now die a happy man! Amazing article.. This is really a helpful site!! Now i know which all companies i need to target after completing my masters. Best info i have ever got on the web. Well-written article. Cheers (y) Thanks for taking the time to collect the data. I love this blog. Thanks a lot. It is a nice blog. It contained detailed information on companies using sas . Hi... Your blog is very informative. Thank you so much. Thank you for writing to me. I would suggest you to learn basic concepts of statistics and then jump to intermediate statistical techniques such as linear regression, logistic regression, significance testing etc. After having a theoretical knowledge of these concepts, use them with SAS. Feel free to contact me if you get stuck in any of these concepts. What is the scope of SAS especially when you r fresher? In analytics, companies generally prefer professionals who have at least one year of experience in analytics field. Hence, there are a very few openings available for freshers. Most of the freshers working in analytics companies were hired from campus drive. Even if you are into different profile, I would suggest you to gain knowledge of SAS programming by practicing SAS coding in dummy datasets. This way, you will be able to crack SAS interviews and get a SAS profile. I am working in Oracle as Sales Tools Analyst. Do you think doing a course in SAS will help me to go Analytics side. It will help you get a SAS programmer or reporting analyst role. To get a core predictive modeler role, you need to learn intermediate and advanced statistical techinques such as linear regression, logistic regression, principle component analysi, k-means clustering etc. It is a good information sharing on this blog. However i am little curious to know about you background since you have such in depth knowledge? Thank you for stopping by. I have an academic background in economics. Could you please share little insight on operation analytics. How one could get into this career. Hi I live in vadodara... I have done MSc in statistics from M S University. And did course of Sas . M fresher. Where should I try for job ? This post has helped me get a better idea about SAS. I want to know whether I can learn SAS, my background is BE Comp Engg passed in 2014 and currently working as a s/w engg. After doing SAS certification how good are the opportunities for me to fetch a job as I will be a fresher to this field. Hello i am pgdm student 2013 pass out i want start my carrier with base sas programmer, so can you guide me how i will prepare and which companies hiring freshers . hi, im working in a private bank for the past 6yrs and now looking for a career shift in analytics. Would it be a safe bet choosing analytics with finance and banking domain in particular. if yes, please let me know the courses i should take up in SAS? By the way, thanks for posting valuable information. Many thanks for an informative review of companies using SAS in India. I just returned from a five day trip to Bangalore where I taught a five day class on Basic to Advanced SAS Programming class. I was wondering if there may be other global companies based in India who may also benefit from my hands-on class as well online support after the class. I am happy find out that there are many companies I can contact. I look forward to your updates. i have taken up the course hoping to get a job in bangalore...! R and Python are very popular tools these days. But SAS still holds largest share in analytics industry (Above 70%). In BFSI, SAS is the primary tool and R/Python as secondary tool. SAS remains primary tool in banking and insurance domain as banks can afford SAS license and they cannot rely on open source tools as tech support is missing. Hope this helps. Thanks! What are the chances of getting job in SAS with biotech background as a fresher? I am completed m.sc statistics passout 2012. and am completed sas.cand I have a 2 experience in data collection. I need to change my sas domain in analytics field. please give me some ideas how to enter my career. I am working in Pre Sales in Web and App development company, I have 4+ Yrs of experience. Now am planning change my domain into SAS by joining SAS intermediate course. Will present experience counts? is SAS programmer and SAS Analyst are same? Most of the analytics companies do not consider non-SAS programming experience as relevant experience. Yes, "SAS Programmer" ," SAS Developer", "SAS Analyst" are same. Sometimes, SAS Analyst profile requires people know about statistical modeling. Since 5 years am working on this Technology but i did not have this much collection. Very Informative article indeed.I want to move into Analytics field.I am currently working in BFSI sector in credit department, but i just hate it.I have done pGDM and BTech before it from good institutes.How should i start to get into this field and thereafter what should i do? I want to know about the scope of SAS in australia and USA. I am having a experience of 1.5 years in SAS.which companies are using SAS there. I don't have the exact list of companies using SAS in US and Australia. SAS holds largest market share in advanced analytics segment everywhere including US and Australia. Radhika here master of pharmacy student,Thanks for such beneficial and productive information. can you please help me out about future in clinical or pharmaceutical sas career? The scope for Clinical data analysis and reporting is huge. SAS is the primary tool in pharma industry for data analysis, data management and statistical programming. Thanks for reply. Deepanshu is it enough data link which have you shared or any other book is available in market for global certification ? You can also refer this book - "SAS Certification Prep Guide: Base Programming"
Very you have very good knowledge. I want to know that I am a physiotherapist and had stats as a subject in second year only. So would I be eligible for SAS program ?? And by Indian SAS program can we apply for overseas jobs ? Yes, you are eligible for SAS Certification. You can apply for overseas jobs as it's a global certification. SAS does not require any programming background. It's very easy to learn. Hi deepanshu,samarth here..I'm a pharmacy graduate with 6 yrs industrial experience....n I wana go for SAS..kindly giv me info abt it.. I am completed B.E computer passout 2011. I have a 3years experience in Lecturership. I need to change my carrier domain in analytics field. please give me some ideas how to enter my career. hi deepanshu, kumar here, I am working in Bank, it is related to different domain not related to SAS, Do you think doing a course in SAS will help me to go Analytics side. Doing a course in SAS will help you to get into Analytics but there is no guarantee. You also need to learn practical application of SAS programming. If i have a option to choose between SSIS or SAS....then what should i choose? please tell me in reference of jobs availability in Delhi NCR. You should choose SAS as there are many jobs demanding SAS in Delhi NCR. SSIS is a data warehousing tool which is totally different from SAS and the type of work would also be different. What is the scope of SAS now ? As it's 2016 , some companies are moving towards other tools . I'm a fresher (B.tech fina year) and have learned base SAS. SAS is still the most popular analytics tool. The vast majority of big companies especially Banks, Insurance Companies and Pharmaceutical companies still rely on SAS as their primary tool of analytics. Some companies have shifted towards R or Python but they use it as a secondary tool and continue using SAS. thanks a lot bro...for the valuable info....thanks a ton again...and can u plz tel me wat are the othr tools i shud learn to get into analytics field.. The most widely used tools other than SAS in analytics industry are R, Python, SQL, Excel. If you aspire for a data science role, you should learn either R or Python. Knowing SQL would help you get a role in data insights or data management role. MS Excel is mostly used for reporting and presenting numbers. Hi, Amazing article. Thank you for sharing information with us. Thanks for the details analysis. I am currently working on functional testing and learned some of the concepts in SAS like Data Steps, Proc SQL and Macros. Can i try to search for the job with this SAS knowledge? amazing blog please maintain it regularly really luck to find a site like this. This is kind of an encyclopedia of everything related to analytics in a crisp. Truely very very informative. This is what we all need.One word MR.Bhalla....Exellent!! Most of the IT companies and banking companies use SAS. We have to remember that SAS still remains as a market leader despite R and Python being competitive just because the support SAS provide to the companies. Which SAS Course is good for forecasting in retail Industry?? I have worked as a data analyst in an e-commerce company. But the tool i used for analysing is Excel now i want to shift to SAS. What should i do in this caree shift process. I have few more doubts in getting placed should i do certification, only then will i get a job bcoz i don have hands on experience in SAS i practised it by myself with the help of internet. What are the things can be done to get a real good job and placed soon? hi am sandeep may i know any openings for sas freshers..
May I also know that any entry level position for SAS fresher? Hi Deepanshu, first of all thank for assembling huge information at single blog. I have a Question regarding my job and future i have 2 yrs exp. as a DATA Analyst in inline inspection of pipeline. IS SAS analytical is good for me. is it compulsary to have international certification of sas to get a job ??? It's not mandatory to have SAS Certification to get a job related to SAS. I did mba in marketing is any opportunity to make carrier in SAS....?? Educational background does not matter much to get into analytics. I have seen a lot of people having degree in MBA in finance and marketing and they excel in analytics industry. Hello,This is Debasis.I am Btech 2012 passout.I am doing SAS now after working for 4.5 years in core industry in completely different domain.Now i am looking for SAS job.How is the opportunity? There are a lot of opportunities for SAS programmers. Patience is the key! Hi Please let me know ....what is the present scope of SAS Analyst post. Hi I have completed my MSc Biotechnology let me know what are job opportunities in Biotech companies after completing SAS training.How is duration of SAS training. Hi I completed B.SC Nursing and having eight years experience in clinical side. Whether this SAS course will suit for me, with these clinical experience. I am very much interested to do clinical SAS. Whether recruiter will consider my profile after completing the course. It is not true at all. SAS is being used widely for data analysis, predictive modeling and BI. Hi did bpharm,now working in retail pharmacy chain. is there any scope after doing SAS? The contract duration is 3 years renewable with a good salary and other incentives. This job is open for both male and female candidate. for review and kindly note that you must have a valid International passport before you apply. Thanks for this highly informative article....I'm so glad to find this...I really needed this info...thanks again!